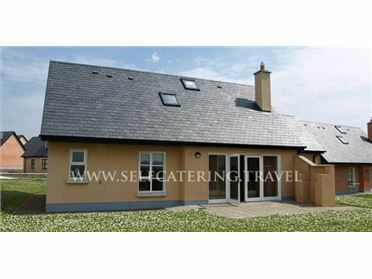 Greaneys Gates is a superb, detached cottage situated two and a half miles from the town of Newcastle West in County Limerick. This cottage sleeps six people in three bedrooms, consisting of a ground floor double with an en-suite shower room, a second ground floor double with Jack-and-Jill access to a shower room, and a first floor double with an en-suite freestanding bath and shower. The cottage also has a kitchen with a dining area, a sitting area with an open fire, and a library. Outside there is off road parking for two cars and a lawned garden with a patio and furniture. Greaneys Gates is a wonderful holiday home with walks and cycle routes from the doorstep. The historic town of Newcastle West in County Limerick offers shops, pubs, gourmet eateries and ruins of the castle, whilst the surrounding area boasts fishing, walks and cycle routes. The medieval village of Adare and the city of Limerick offer culture, heritage and charm making this part of the Emerald Isle an ideal place to stay. For an enticing mix of old and new, County Limerick is ideal, with castles and art galleries attracting visitors whilst the tranquil pastureland, forest trails and mountainous scenery of the county make the perfect escape. Oil central heating with open fire. Electric oven and hob, microwave, fridge, freezer, washing machine, tumble dryer, dishwasher, TV with Free-to-air channels, DVD, WiFi, selection of books. Fuel, power and starter pack for fire inc. in rent. Bed linen and towels inc. in rent. Off road parking for 2 cars. Lawned garden with patio and furniture. Sorry, no pets and no smoking. Shop and pub 2.5 miles. .